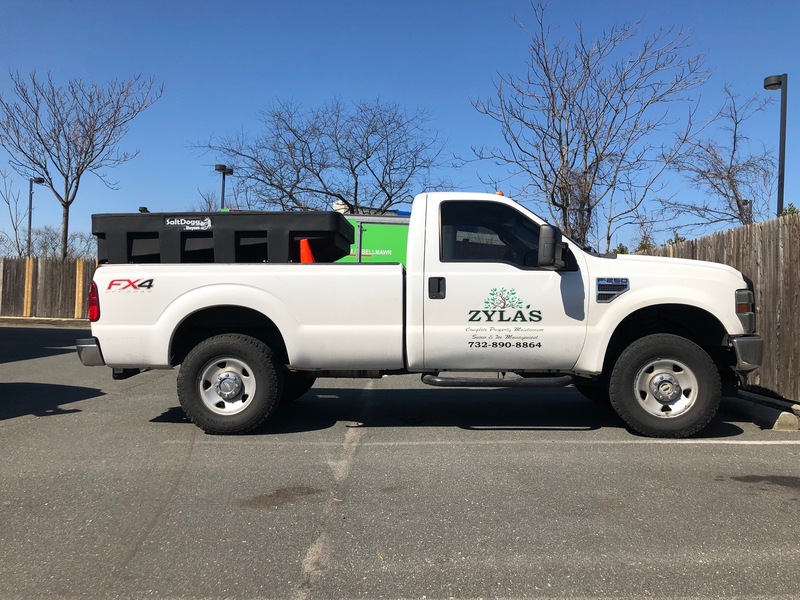 As the business has grown over the years, Zyla's Landscaping has been adding new vehicles to it's fleet to help better serve it's customers. But with every new vehicle they added they lost a little bit of brand consistency, as these new vehicles were missing logos, consistent design, and strong impactful graphics. 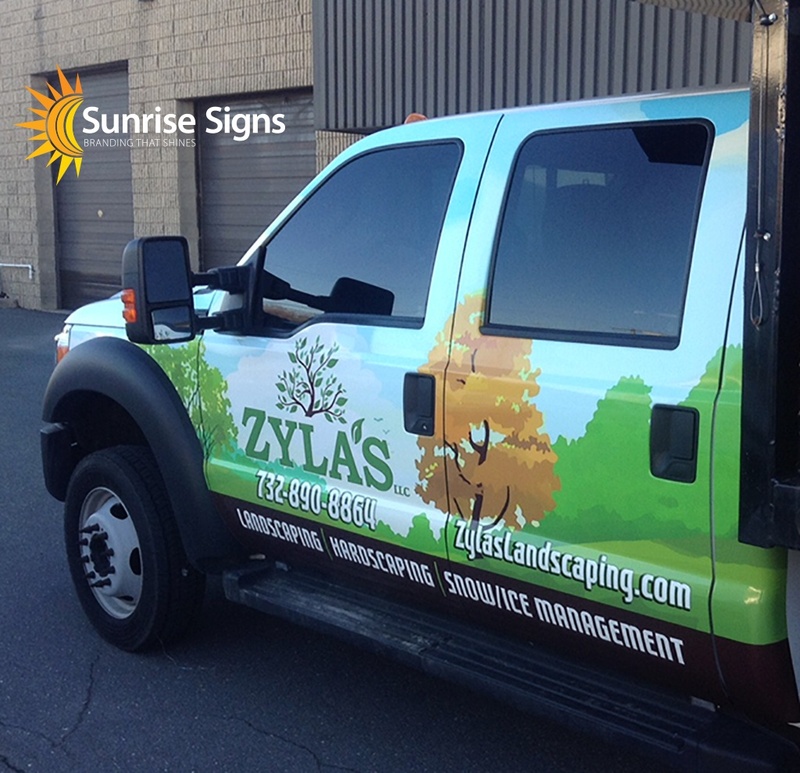 Zyla's knew they needed to step up their fleet branding game - so they called Sunrise Signs. 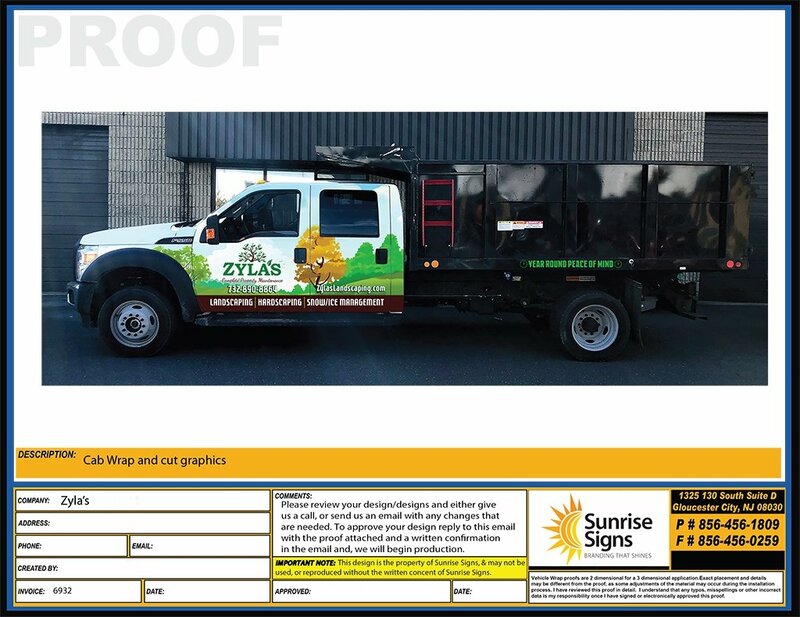 Zyla's came to us initially with three vehicles to design and wrap - a work pickup truck, a dump truck, and a tow behind trailer. 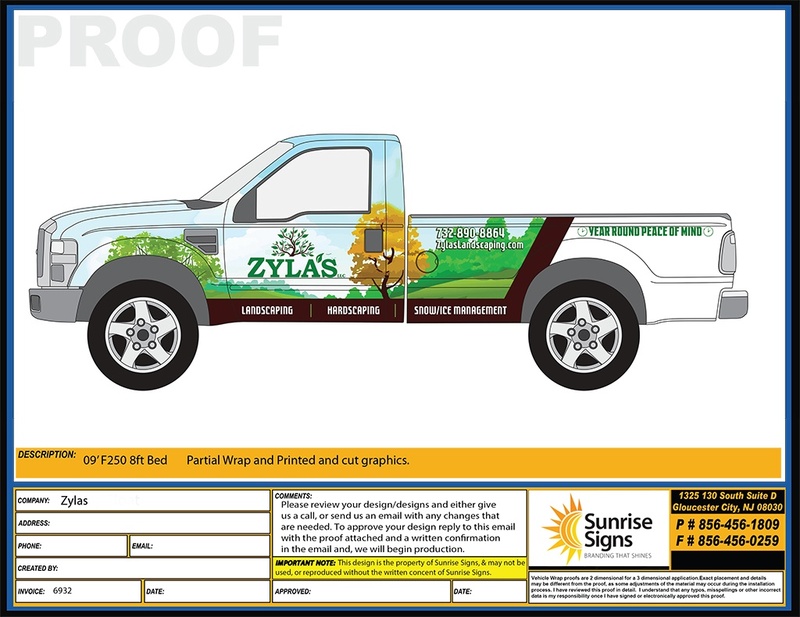 The pickup truck previously had a simple cut logo on the side, but Zyla's wanted to have a much larger impact, so we recommended using a combination of full wrap graphics and contour cut decals. After their design consultation, we came up with a plan to create a clean design with strong colors that would help their vehicle fleet be easily seen when driving down the road and make strong impressions when arriving to job sites. 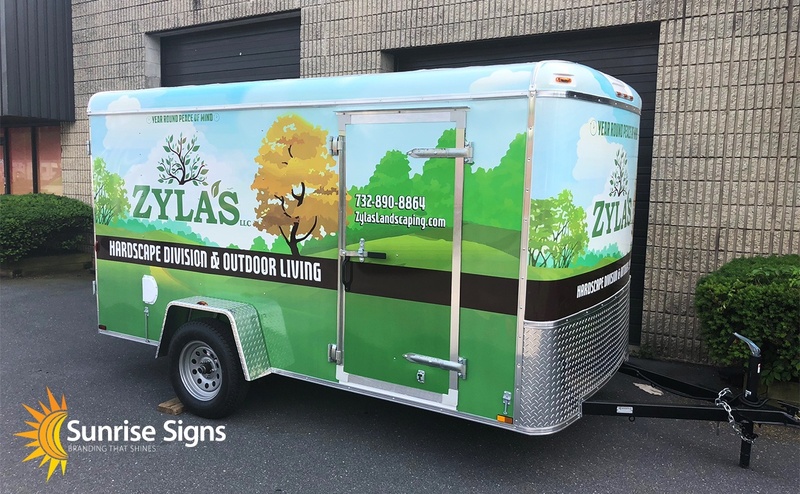 Our designers worked with the themes of Zyla's existing logo and fleshed those elements out into a bold design that could be easily adapted to fit the body styles of different vehicles. Using scalable vector elements, our designers custom made the tree background and landscape elements seen in the wrap design. ...So you can visualize everything before we print! Zyla's Ford F-250 pickup truck got quite a makeover, going from having a simple logo on its doors to a 3/4 partial wrap, with full wrap coverage on the hood. 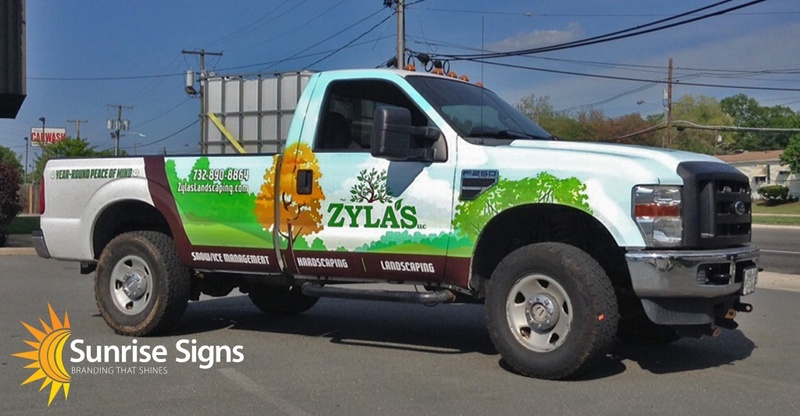 No longer a simple white truck with a logo, Zyla's pickup now catches the eye with it's landscape scenery and bright colors. The designers used the guiding brown bar at the bottom to cleanly break the area between wrapped and painted areas on the bed of the truck. Cut vinyl decals were then used on the unwrapped bed areas and tailgate to bring the all of the vehicle's branding together. But it can't compare to digitally printed wrapped graphics! Next in the fleet was a Ford F-550 Pickup/Dump truck. We applied a full wrap to the truck's cab and hood, using the same brand elements and layout from their previous truck. Adjustments were made to the design to specifically fit the F-550 body style. Since the dump portion of the truck gets a little more physical than the rest of the vehicle, we recommended using cut vinyl graphics to still get the most use out of the available space. The sides were given some cut lettering, while the rear of the dump used cut, digitally printed reflective graphics. These reflective vinyls will literally help Zyla's shine brighter than the rest of their competition! Quick! Someone get this vehicle some branding! You're not going to miss this truck now! Digitally printed, cut reflective graphics for the rear. You can't miss those! 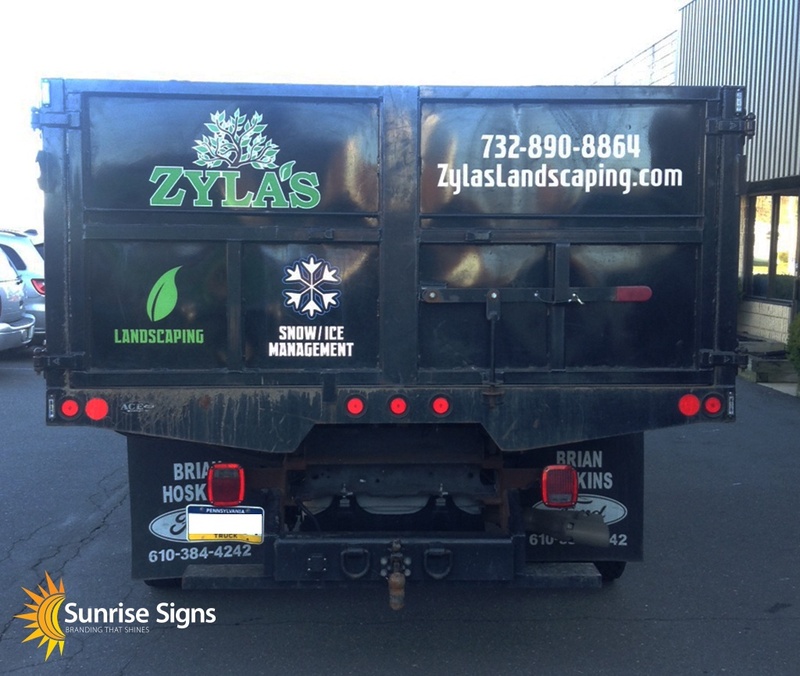 The final piece in this project was a full wrap on Zyla's Tow Behind Trailer. We used the exact same brand elements from the other vehicles, but fleshed them out into a full scene to compliment the extra space on the trailer. Pictures don't do justice to the bold colors and strong impression this trailer makes! A Trailer in Tow Makes Your Branding Go! With these vehicles wrapped and branded, Zyla's will create strong, memorable impressions wherever they go with consistent vehicle advertising. As Zyla's grows and adds more vehicles to their fleet, we'll be alongside the entire way to help them achieve the strong, eye-catching fleet branding that every business needs. "Wonderful experience from start to finish. Everyone at Sunrise was very easy to work with and helpful. Their designers created the perfect graphic for my company. Great communication and professional throughout the whole process. They were very flexible with my busy schedule and accommodated me with no problems. Thank you for everything." Does your company have vehicles on the road without any branding? Are you making the strongest impression possible to your customers and potential clients? Give us a call and let's have a conversation about how we can make your fleet start working for you!